The strips on the second day of application (left) and then on the 12th (right). I change my nail polish at least once a week. With so many new colors coming into the office daily, I can’t control myself. But with my toes, I can go a few weeks without changing it up. 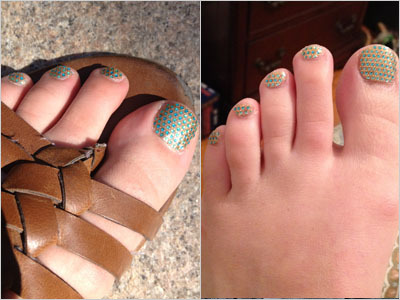 That’s why the idea of using nail strips for my toes has been appealing since I first heard of them. Like the nail strips for your fingers, they are guaranteed to last up to 10 days. I decided to put the little strips to the test and see just how long I could hold out before giving myself another at-home pedi. I applied Dashing Diva fx bling in Go Green, and although they are normally only applied in salons using the gel manicure, they worked just like any other nail strip. I applied and filed all ten nails in about 30 minutes. And 12 days later, the strips are holding together pretty strong. Only a few pieces on the side are peeling off. What I love about using the strips on my toes, opposed to my fingers, is that when the strips start peeling, it doesn’t matter as much. Your fingers are being observed up close and any imperfection is very noticeable. It’s much easier to get away with a peeling nail strip on your toes. To get the design I’m wearing, you have to get them applied at a Dashing Diva salon. And because they’re applied as a gel pedicure, they are guaranteed to last longer than mine will. But if you want to try the look at home, you can experiment with Sally Hansen’s new line of toe strips – Sally Hansen Pedicure Salon Effects Real Nail Polish Strips in Toe-riffic ($9.99, Cvs.com). Another trick is to use any nail strip, but turn it sideways to cover the entire toe nail. For the small nails, do the same thing, but cut the excess off and file to fit. Are you going to give your toes a little makeover this season?